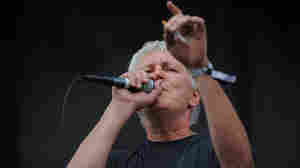 December 18, 2011  Of all the bands that have re-formed in recent years, Guided by Voices' return in 2010 felt inevitable. Let's Go Eat the Factory fits right in with the band's vast repertoire. August 19, 2003  Independent music critic Christian Bordal talks with NPR's Alex Chadwick about the latest CD by the relatively obscure "indie-rock" band Guided by Voices. April 20, 2001  Rock critic Ken Tucker reviews Isolation Drills the new release by the band Guided by Voices. May 30, 2011  Still kicking after a long hiatus, Robert Pollard and company kick out a set of vintage power pop for the Sasquatch crowd. October 12, 2004  Early folk music pioneer Elizabeth Cotten; "Urban" blues forefather Leroy Carr; A psychotic reaction from Michael Powers; Traditional Chinese zheng artist Hong Ting and more.